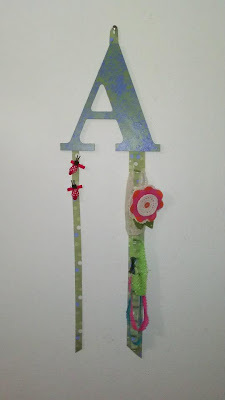 Apples to Applique: Completed Nursery! Our little girl's nursery is finally complete, with exactly 2 weeks until her due date! 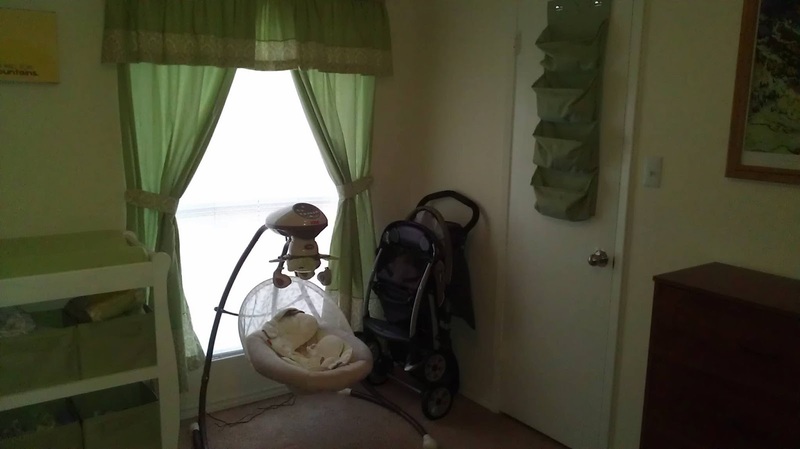 This isn't my typical tutorial-style post; I just couldn't resist showing off her little room. 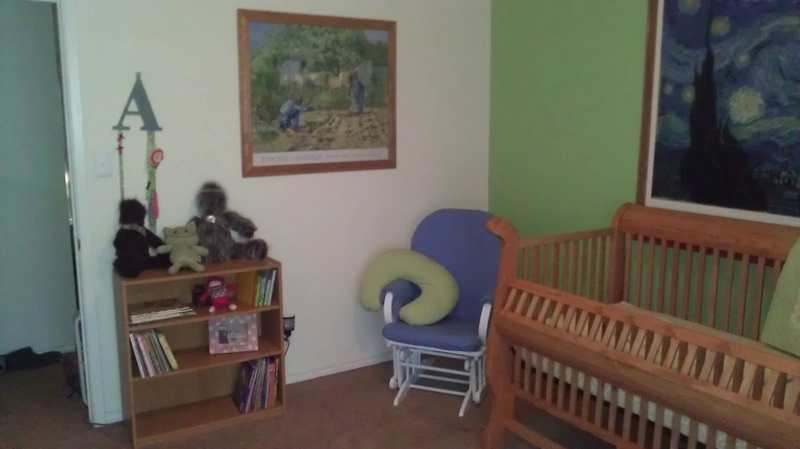 There are, however, links throughout the post to the various tutorials I wrote while putting this room together. 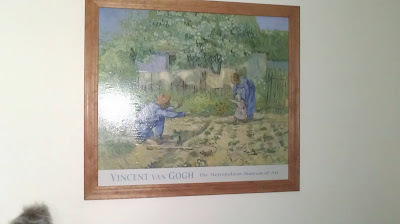 Hubby and I both love Vincent Van Gogh, especially "Starry Night"; this became the inspiration for the nursery. I made the quilt; no tutorial for that--even though I sew, I am NOT a quilter, and I'm pretty sure I did things "incorrectly", so I didn't want to steer anyone wrong with my directions--ha! I also made the fitted crib sheets, which were surprisingly quick and easy. 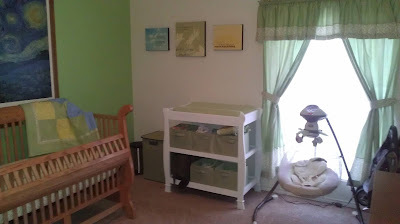 Here's her changing table, which started out black and now is repainted to a refreshing white. 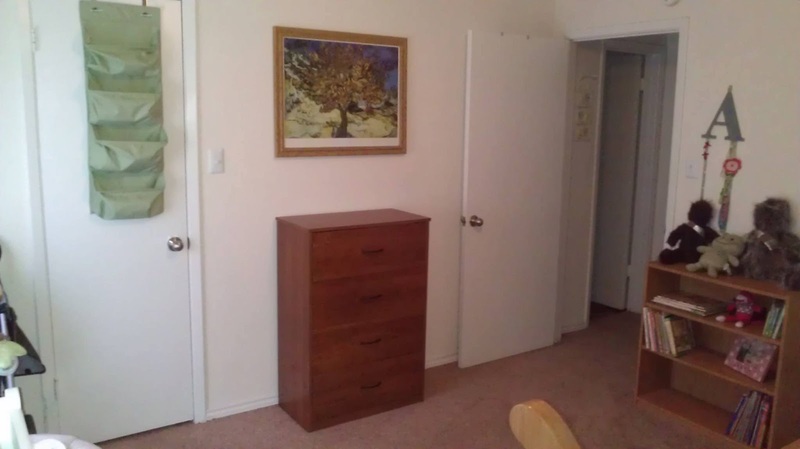 It's amazing how a random mix of furniture collected from here, there, and everywhere can be made to look like it belongs together with a little updating. 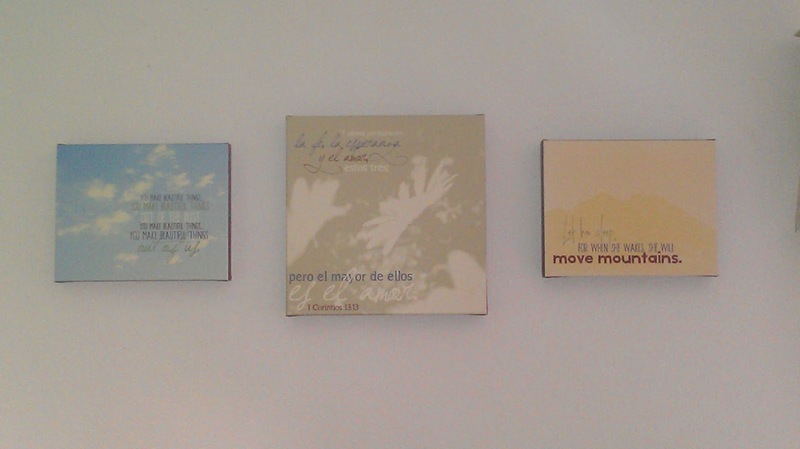 These canvases. For some reason my picture doesn't look very clear; I'm not a photographer, either, as people who have followed my blog may have noticed. :) Anyway, this picture does not do them justice, but these lovely canvases were custom designed for our little girl by Rich in Blessings Photography. 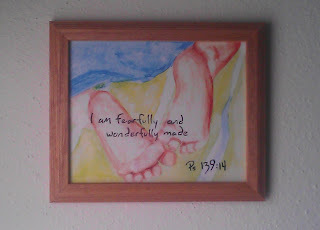 Traci took our nursery colors and some favorite quotes/Scripture verses and turned them into lovely artwork, made all the more special because they were designed just for our daughter. Traci does awesome custom work, but she also has dozens of adorable prints ready to order; click the link to view her gallery. This corner houses the one window in the room, for which I made the curtains, valence, and tie-backs. 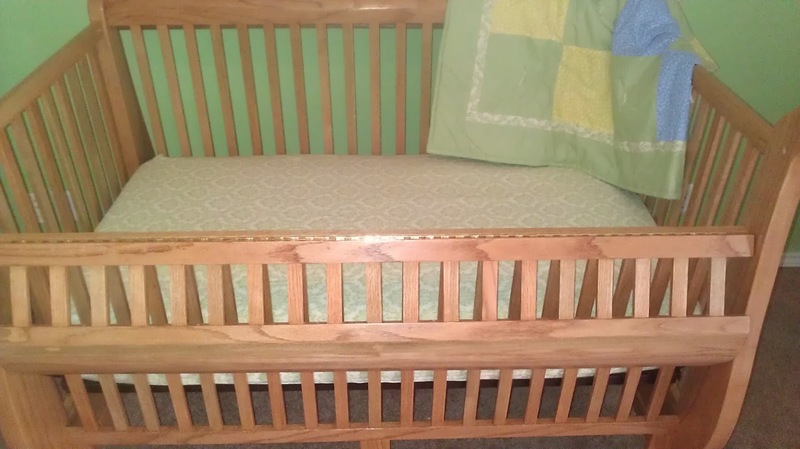 I love how they turned out, and how they match the sheets and quilt. Continuing around the room is the dresser with Van Gogh's "Mulberry Tree". 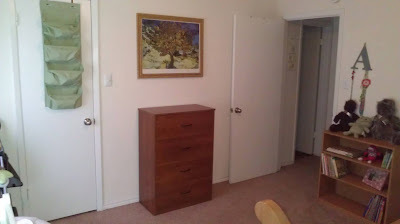 I need to find something cutesy to set on the dresser--maybe some picture frames or something. We'll see. 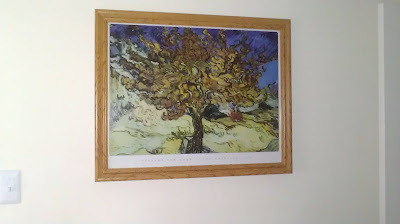 The next wall features Van Gogh's "First Steps"--what a perfect picture for a nursery! 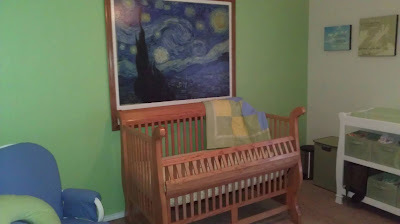 We painted and reupholstered the glider, but as it was my first attempt at reupholstery, I did not make a tutorial. I got the job done, but probably incorrectly. However, it looks a million times better than it used to! Also on this wall is the bow and headband holder, which I did make a tutorial for. 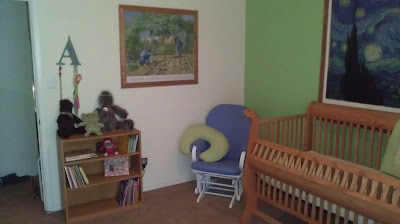 So there you have it; our nursery is finally complete and ready for its inhabitant, who can arrive any day now! Thanks Aunt Levon! We can't wait for her to meet everyone! You guys did such a great job! I'm excited for you and your family. WOW! 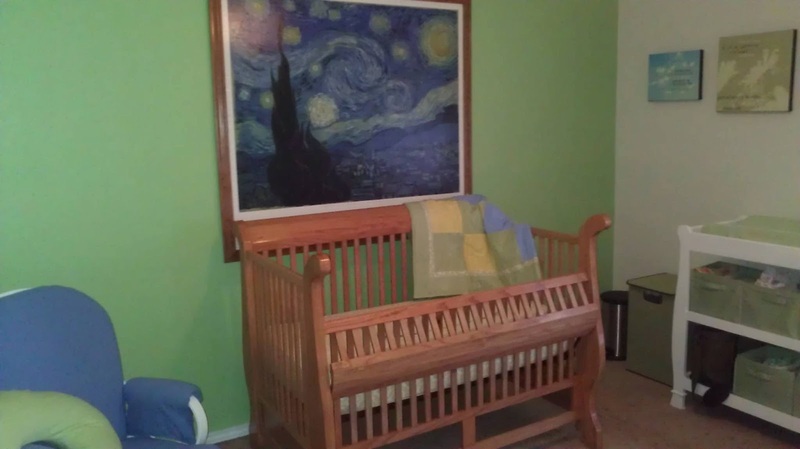 What a beautiful nursery and I love that your husband made the whole crib!! WOW!! :) I just discovered your blog and am excited to be your newest follower via GFC! :) I hope that you have a lovely weekend and I can't wait to read more!